Before you move to Vancouver, let Vancouverite Jill Von Sprecken give you the inside track on a few things you should know about your new home city. 1. Finding a place to live may be a hurdle. Rental vacancy rates in Vancouver are some of the lowest in Canada, but home prices are among the country’s highest. Be prepared to do your due diligence when finding a suitable rental. Scouring Craigslist and walking neighbourhoods in search of vacancy signs are good ways to get started. 2. Biking, walking and car-sharing are great ways of getting around. Most neighbourhoods are very walkable, and the local transit system includes the SeaBus and SkyTrain rapid transit lines. Have a driver’s licence? Sign up for car-share services Car2Go and Evo. But to really embrace the local lifestyle, buy a bicycle (all your future friends will have one) or sign up for bike-share program Mobi. 3. The rain doesn’t slow Vancouverites down. The average annual precipitation is 44 inches (less than Miami or New Orleans, by the way), making it a wet but wonderful place to live. Summers offer a welcome, sunny reprieve. But be sure to buy an umbrella and boots to navigate the months between October and April. Fresh rain glistens on the streets of Gastown. 4. Speaking of rain, umbrella etiquette is a thing. Some pointers to get you started: leave the golf umbrella on the course; when meeting another umbrella on a crowded sidewalk, either raise or lower your brolly depending on your height; save the awnings for the umbrella-less; and when entering a building, leave your bumbershoot in the designated holder. 5. There’s a Vancouver neighbourhood to suit every resident. Want to live in the thick of things? 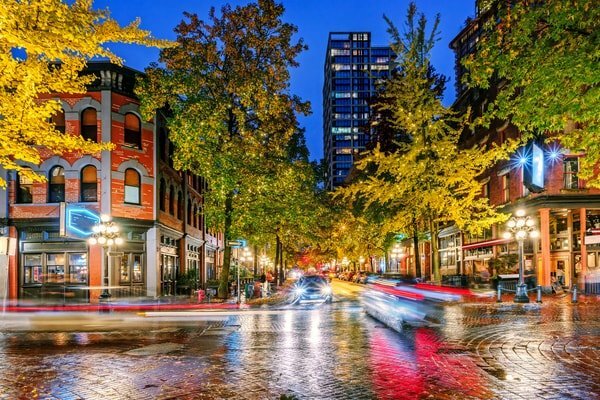 Try the West End, with its thriving LGBTQ community, or fashion-forward Yaletown. Keen on a quirkier vibe? East Van is more off-beat — start your search in Mount Pleasant or close to Main Street or Commercial Drive. Young families and the health-conscious flock to Kitsilano and Olympic Village. See this Vancouver neighbourhoods guide to learn more. 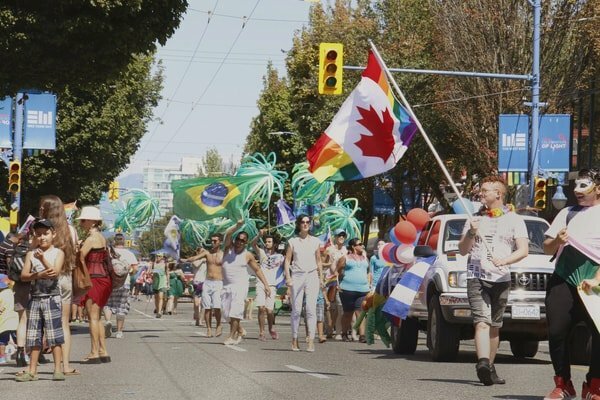 Pride, diversity, and sunshine in Vancouver’s West End. 6. Know before you go to the Downtown Eastside. “Canada’s poorest postal code” is known for drug addiction, mental illness and poverty. If you feel threatened by these kinds of encounters, steer clear or bring a friend until you feel comfortable navigating the area yourself. But keep in mind that it’s not all bad: the DTES is a historic and close-knit community, and ground zero for social activism. In fact, a recent report found that roughly one-quarter of Vancouver residents feel socially isolated. Meet people by joining a club or sports team, taking a class and getting active in your community. 8. Healthy living is a lifestyle here. Vancouverites eat well, exercise for fun, and keep their backsides looking good in yoga pants. Join in by walking or biking the seawall, hiking the North Shore, or taking a yoga class. Then refuel at one of the many vegetarian or vegan restaurants around town. You could go to yoga class, or just pose on a rock. When you move to Vancouver, the choice is yours. 9. Get ready to try sushi and craft beer. Thanks to the city’s influx of newcomers and proximity to the Pacific (and its bounty of seafood), Asian cuisine here is some of the world’s best. Pair that with the local craft beer revival and you have a winning combination. 10. The great outdoors is one of the city’s greatest assets. Even if you’re not interested in climbing mountains or tackling trails, the seawall, beaches and parks tend to be meeting places for many Vancouverites. Embrace the West Coast lifestyle, and before long you’ll be doing yoga on the beach alongside the locals. 11. A few quick tricks can help you orient yourself. See mountains? You’re facing North. And remember: the West End is a neighbourhood in downtown Vancouver; the West Side spans Kitsilano to UBC; West Vancouver (West Van for short) is a city on the North Shore; and New West, or New Westminster, is a city 30 minutes east. And Vancouver Island isn’t in Vancouver at all — it’s a two-hour ferry ride away, and is home to BC’s capital city, Victoria. 12. Film crews are a common sight on Vancouver streets. One of the largest film production centres in North America, Vancouver has earned the nickname “Hollywood North.” It’s not uncommon to see notices posted on buildings warning of upcoming filming, or to find your way blocked by camera-toting crews. Ask any local, and they’ll gladly tell you what movies they’ve seen being filmed or celebrities they’ve encountered. Want to learn more about moving to Vancouver? Visit our Vancouver city guide. Still not sure how to make the move to Canada? Our immigration guide will point you in the right direction.